For several years now, Oracle has been providing the bug fix and new functionality catalog known as the Cumulative Feature Overview (CFO) tool. This tool is designed to simplify the process of identifying which fixes and new features are available in each release. For customers who have upgraded to application release 9.2, the CFO tools facilitates Selective Adoption by providing convenient access to a comprehensive list of fixes and functionality in each new PeopleSoft 9.2 Image, allowing application business owners to work with technical staff to efficiently identify the features available to be adopted. Now, the enhanced CFO tool takes the process one step further and makes it even easier to identify needed or desired updates. After standing up the latest PeopleSoft Update Image (PI), Change Assistant can be used to extract a report of all updates previously applied to the selected target database. 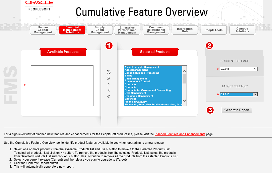 This list can then be uploaded to the CFO tool to allow the tool to produce a unique and custom list of only those updates not already applied to the target. Having the pre-filtered result set allows application business owners to very easily identify new features to have the greatest impact on their operations and shortens the analysis time required to create the Change Package in the PI. A well-defined Selective Adoption strategy will incorporate using the CFO tool as the starting point for joint IT/business discussions and decision-making, and enables customers to get the most benefit from Oracle’s ongoing improvements to PeopleSoft applications and technologies.